A Metro Vancouver mother who says she's fed up with second-hand smoke creeping into her condo from a unit below is set to have her complaints heard in the B.C. legislature. Strata laws at Naomi Baker's Langley apartment building allow people to smoke on the property as long as they only do so in their own suites. But the new mother said she and her husband have been dealing with the smell of cigarette and marijuana smoke wafting up into their home ever since they first bought the condo in 2016. In B.C., smoking is currently allowed in any multi-unit building unless a strata or tenancy agreement states otherwise. But now that she has a three-month-old baby in the home, Baker decided to challenge that rule for the sake of her daughter's health. "Here we are with this beautiful baby, this innocent child, and literally she has been living in a home exposed to poisonous toxic fumes every day of her life—never mind while she was growing inside me," Baker said. "As a mother, I'd do anything for her." 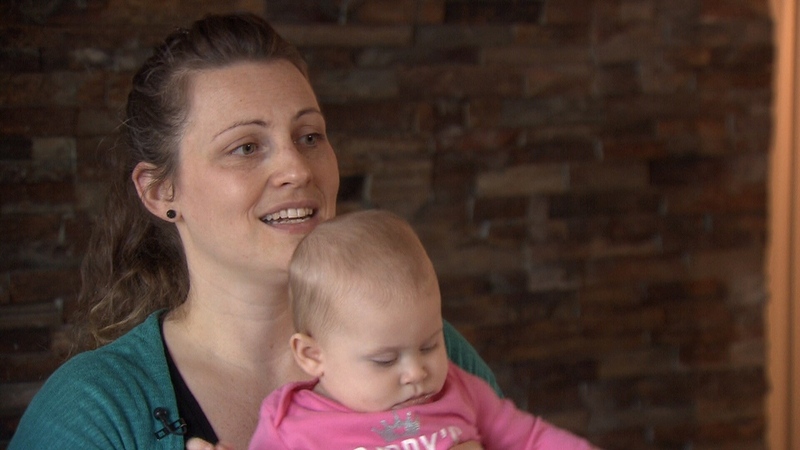 The new mother started a petition in August calling on MLAs and Housing Minister Selina Robinson to make all multi-unit dwellings in the province smoke-free, including rentals and social housing buildings. "Every night we go to sleep praying that our daughter wakes up the next morning as second hand smoke exposure increases the risk of Sudden Infant Death Syndrome (SIDS) and she is exactly in the two to six month age window when the risk is at its greatest. Never mind the additional risks she has of developing asthma, allergies and other health issues," she said in the petition. While many strata associations across the province have already banned smoking, the executive director B.C. 's Condominium Home Owners' Association said many more residents are being exposed to the effects of smokers living around them. "The problem about that is that it causes a nuisance to other people," Tony Gioventu told CTV News. "By and far, when you live in a condo, your home is not your castle. You don't have the right to do activities that cause a nuisance or harm to anybody else within your building." Baker added that she and her husband have tried everything from using fans to leaving windows open and sealing up every crack they could find in an effort to keep the smoke out of their home, but have been unsuccessful. "The problem is we have no choice about breathing. A smoker could choose to go outside to smoke or use a nicotine patch if our building was smoke-free but we cannot choose whether or not to breathe," she wrote. "Smoke-free multi-unit dwellings will vastly improve the health of British Columbians, reduce the risk of apartment/condo fires, and reduce cost of healthcare by reducing preventable health issues caused by second-hand smoke." Baker's petition has garnered more than 13,000 signatures and caught the attention of Langley MLA Mary Polak, who has agreed to bring up the issue in parliament next month. Gioventu said the principles underlying Baker's petition could be difficult for the province to put into practice. For one, some of the people smoking in their units are doing so because of special circumstances like addictions or medical conditions. "It's going to be complicated, and strata corporations may have to provide some special accommodation or some special accommodation conditions for those individuals," Gioventu said. The far-reaching nature of the strata designation is another problem because it applies to duplexes and other property types where second-hand smoke might not be a significant issue. That means that, in reality, the government would have to adjust laws in a way that restrict smoking only in specific kinds of dwellings governed by strata corporations. "It's a complicated issue for government to tackle and for policy-makers because are you really going to start restricting the rights of individuals within units that have no impact in other units as well?" Gioventu said. "That’s where this becomes a much more complicated problem to solve." Naomi Baker speaks to CTV News on Jan. 7, 2019.